Went to an amazing Italian restaurant to review their food for Think Magazine, a magazine i freelance for. I’ve taken the liberty of including my review in this post together with pictures. pardon the low res. quality… forgot my digital camera so i took the pictures with my trusty Nokia 7610. Enjoy! Suffice to say, Italian cuisine has become more of a lifestyle than anything else. Every corner you turn, there’s definitely a pizza or pasta place for any person craving for something hearty and filling. With so many Italian eateries popping up faster than you can say ‘mozzarella’, it’s no doubt we’re spoilt for choice. But Italian is as Italian gets. It’s easier to pass off as a pseudo Italiano outfit than to actually carve a name for being an authentic Italian restaurant. Amalfi belongs to the latter category. Touted as an Italian pizza place, the classy restaurant has a wood fire oven which is used to cook their thin-crusted pizzas. We’re talking about quality here, so you can say good bye to those soggy pizza bases that comes topped with even meagre ingredients. At Amalfi’s, you’re definitely getting what you deserve; that is, great, unadulterated, pure Italian cuisine. Having chosen the Amalfi’s Beef Carpaccio ($14.90) as my antipasto, I was sure I’d come to the right place. Not only was the carpaccio fresh and tender, it was dressed with a wonderful combination of Worchester, mayonnaise and tuna sauce. 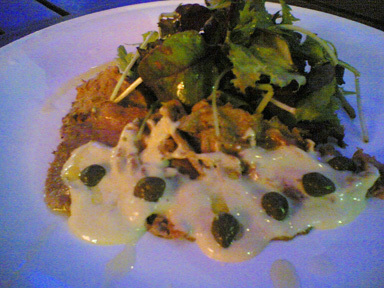 The capers added a twist to the pleasant dish. It helped that the thin tenderloin slices came in the right size and texture. 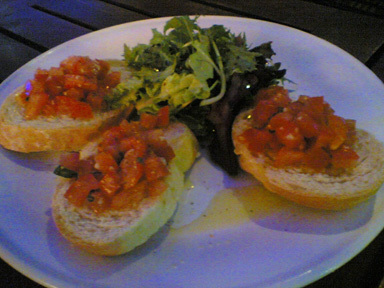 The Bruschetta ($6.90) was my next choice and I loved the simplicity of it. It wasn’t overwhelming at all. In fact, the tomato concasse on the crispy toasted bread slices oozed with such sweet juiciness that I simply couldn’t help finishing it in a few seconds. Served with garlic and basil, the bruschetta is an understated delight. 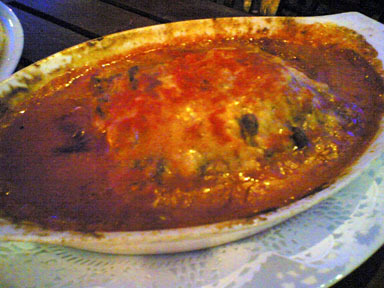 As a fan of lasagnas, I had to try their Lasagna Al Forno ($14.90). Might I say, this lasagna is in a league of its own. I can honestly say that I’ve never tasted lasagna this good. It’s definitely a classic. The baked pasta was incredibly soft yet firm enough to hold the entire dish together. The Bolognese meat sauce was tasty but not too overpowering. Topped with a fair bit of parmesan cheese and béchamel sauce, this lasagna sent me on a high. This layered package seems to blend so well together that you can’t find anything nasty about it at all. It’s best eaten warm though. You wouldn’t want to have hardened cheese. Amazing stuff. If you’re a cheese person, you have to try their Gorgonzola pizza ($16.90). Topped with mozzarella, blue cheese and gorgonzola, this is honestly a back to basics kind of pizza. 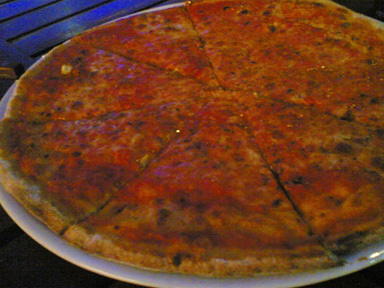 It comes with a tomato base and the crust was ultimately crispy, just the way I like it. This is how all pizzas should be! They were rather generous with their cheeses too. Amalfi’s salads are pretty impressive too. 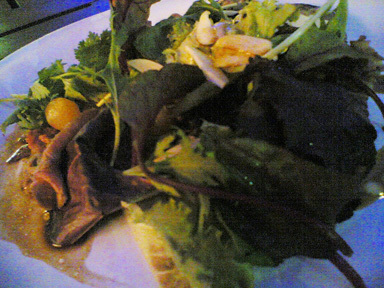 I got a taste of their Cilantro con carne salad ($16.90) and liked what I saw. Served with grilled egg plant, garlic and coriander, the seared beef that same with it was chewy and fresh. The sweet onion gave it a certain zing. It certainly helps that their dishes are so well presented. At least they made an effort to give an artistic edge to all their dishes. Amalfi’s desserts didn’t fail to please either. Their Chocolate Profiteroles ($6.90) were out of this world. 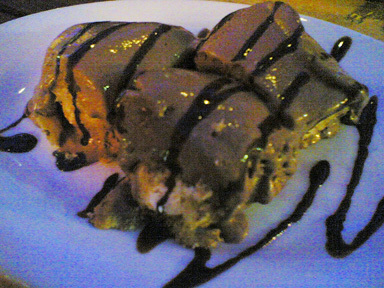 The cream was fresh and light while the chocolate ice-cream was irresistible. I found their Bavarese Cheesecake ($8.90) rather unique. It’s not as heavy as the ones you have else where. There’s almost a milky taste to this one. You don’t feel sick after having too much of it. Definitely a must try. 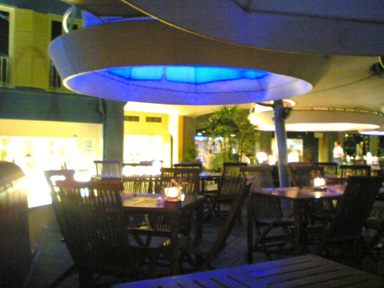 You’ll be pleased to know that Amalfi also has an al fresco area where you can choose to dine by the beautiful Singapore river along Clarke Quay. Be sure to bring along a date to complete the delectable evening. You really don’t have to travel all the way to Italy to taste real Italian food you know? 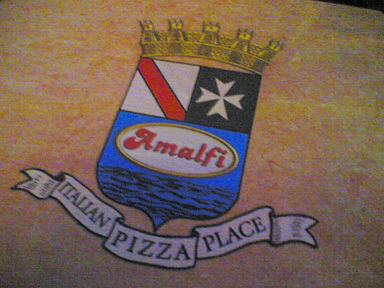 So there you have it… my dining experience at Amalfi. I’ll surely go back there some day. Just discovered I have so many more ‘best eats’ to share. They come with pictures too. well thanks to my habit of shooting almost everything i consume. will give you an insight on best places to have authentic singapore food. speaking of singaporean food, I just came across yet another amazing food blog today called Ono Kine Grindz. It’s by a Hawaiian native if i’m not wrong. well what’s interesting is that he’s been to Singapore and loves the food here. Well Singaporean food is good, so I can see why. Not only is the food here to die for, there’s just too many to choose from! it’s really a food paradise. believe me, i know. okay, it’s getting late… i’ll post more stuff another time. tataz.